What’s the worst part of any ski vacation? All those hours spent researching where to go! Some seek that cool mountain vibe. For other’s it’s all about amenities or vertical feet. 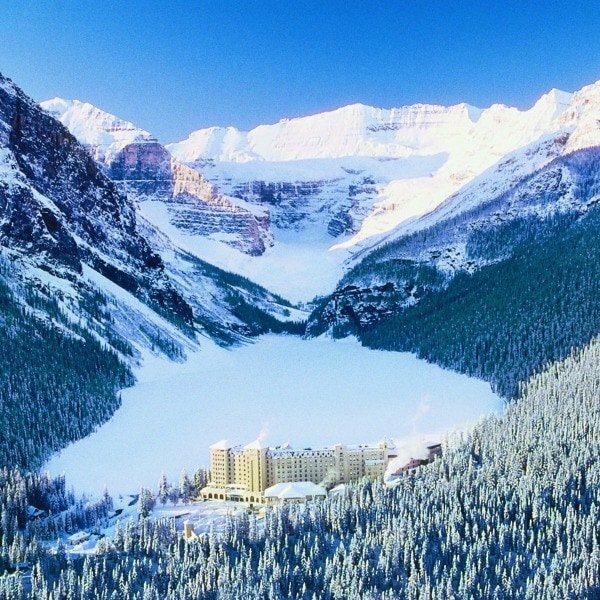 At Canada’s Lake Louise Ski Resort you don’t have to choose. Here, you’ll find a true winter wonderland with an international ski hill. And it’s all set inside Banff National Park. Layer that with a swish hotel, opportunities to skate around an ice castle, and elevated cuisine. This is a ski destination that ticks all of the right boxes. 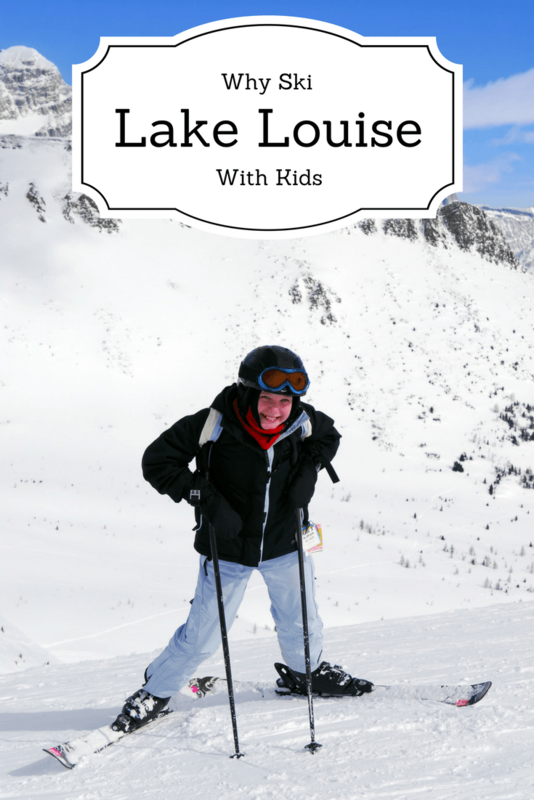 Here’s a look at why you ought to ski Lake Louise with kids. Book your Lake Louise family ski trip now! There are few ski hills that have thought through the family angle as conscientiously as Lake Louise. For starters, their on-hill daycare takes babes as young as 3 weeks old. (Most Canadian ski resorts aren’t licensed to take children until they’re 18 months.) Of course, Louise offers a ski school. Group ski lessons are available for ages 5 to 12, with half and full day options available. Or, you can opt for the private route. For the littles, Kinderski Group Lessons operates on weekends for ages 3 to 4. With Kinderski, young children ski for either one or two hours and an hour of play is also included. Lake Louise is a skier’s mountain. It’s famed for hosting the start of the World Cup every November. Best for families, there’s a green (beginner) run from every chair lift. No matter where you go in this resort, you’ll be confident skiing with your littles, knowing there’s always an approachable way down. Plus, Lake Louise offers not one, but three magic carpets on the bunny hill. After the kids graduate to bigger slopes, I recommend starting on Run #9: Wiwaxy. This beginner’s run sports a wide groomed path with epic views of the iconic Fairmont Chateau Lake Louise. You’ll pinch yourself for skiing in such a picturesque spot. Then there’s the practicality that some kids won’t be interested in skiing. No matter, simply unleash them in the Sunny Tube Park and watch them barrel down the hill on dedicated lanes. Join them for the same adrenaline rush as skiing. If that’s not up your alley, grab a sled and swoosh down the gentle paths right next to the lake. Lake Louise is also well known for its cross country skiing. You can glide through the woods on several trails that start from the Fairmont Chateau Lake Louise parking lot. And the most magical winter experience you can ever experience is skating through an ice castle on a frozen lake framed by the Rocky Mountains. Lake Louise is a tiny hamlet about a two-hour drive from Calgary and less than an hour from the town of Banff. It’s in Banff National Park, so development is limited. There are only half-dozen accommodation options, but what they’ve got is pretty sweet. On the banks of its famous turquoise-hued lake sits Fairmont Chateau Lake Louise. 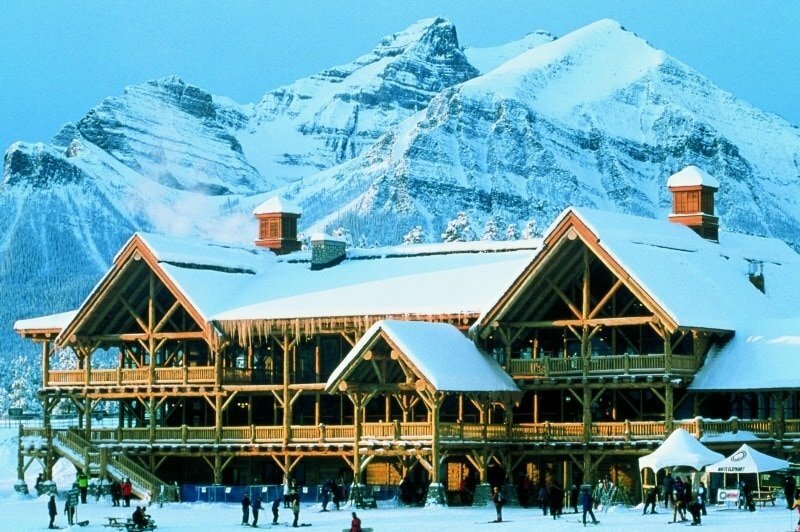 For the ultimate ski trip at Lake Louise with kids, this is where you’ll want to stay! Fairmont’s attention to detail makes this place stand out. When your child has a dedicated kid check-in, you know you’re going to be well taken care of. 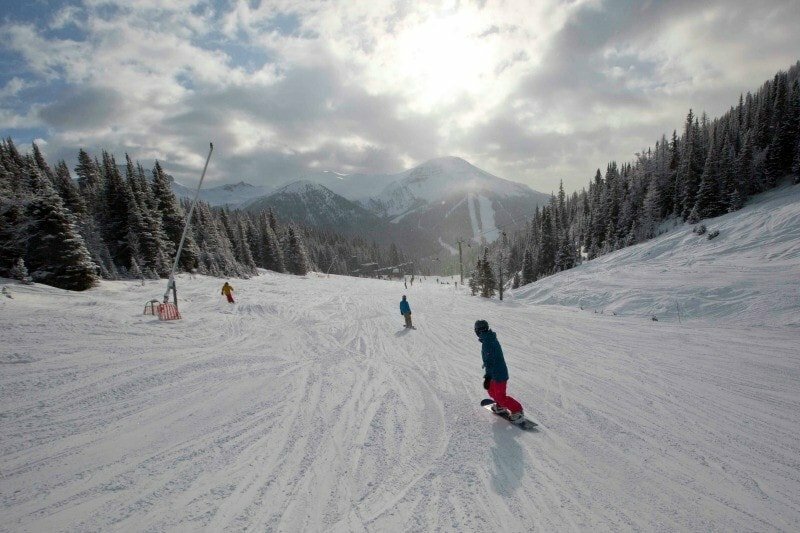 Ski rentals are available directly from the hotel and there’s a complimentary shuttle to and from the ski hill every half-hour. 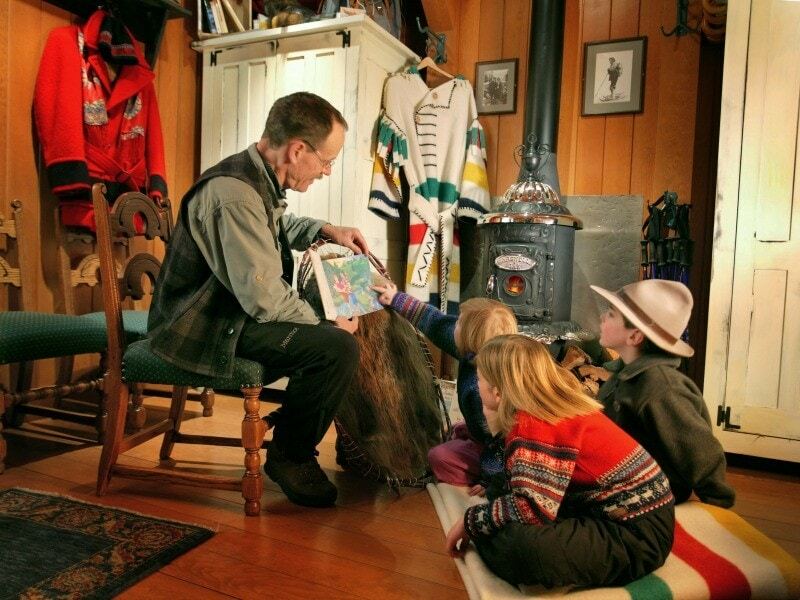 When visiting Lake Louise in winter, be sure to check out the Fairmont’s Winter Kid’s Camp. It’s where wee ones can go sledding, take a photo scavenger hunt or decorate cookies. If your family is anything like mine, it’s better if someone else teaches your child how to snowshoe or cross country ski. Mountain Heritage Guides take families out into the wilderness and provide historical context while teaching new winter sport skills. You can also rent skates, snowshoes or cross country skis on-site and explore the icy expanse of the lake on your own. At Lake Louise Ski Resort, you’ll find a classic day lodge for quick eats. I recommend skipping it and eating at Kuma Yama instead. Having lived in Japan for four years, I can verify this sushi restaurant is top notch. Then there’s Whitehorn Bistro, a mid-mountain restaurant serving up elevated comfort food. Choose from short ribs, veal meatballs, fondue, seafood risotto and more. Although every ski resort jacks up their prices slightly, this restaurant offers excellent value. If staying at the Fairmont, you’ll love Alpine Social. This pub-style restaurant dishes out large, family-style portions. Children are most welcome and there’s a free photo booth to amuse them. For adults, take advantage of Fairmont’s babysitting service or drop the kids at the Fairmont Pajama Party and hit up Walliser Stube. Of course, kids can dine here too but it makes the perfect spot date night. You’ll swear you’re in the Alps inside this German-Swiss restaurant. They really nailed it from the atmosphere, the design, the fondue, and the large selection of Alpine beers. My favorite Walliser Stube experience, however, is their afternoon tea. Expect the classic tiered stand loaded with finger sandwiches, scones and petit fours. Tip up your pinkie and sip your hot tea of choice whilst staring through massive cathedral-shaped windows onto the lake and glacier. Lake Louise is an international ski hill – one of Canada’s most famous – yet it retains a welcoming family vibe. 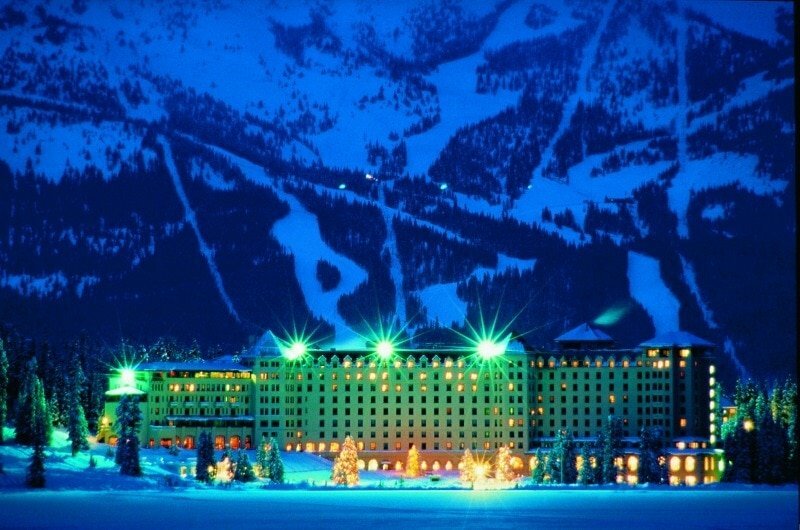 Its location within a national park makes a ski vacation at Lake Louise with kids special indeed. Now, how will you spend all those researching hours I just saved you? Book your Lake Louise ski trip with TripAdvisor now or use the Booking.com form below! Would you like to visit Lake Louise with kids? Let us know in the comments below! A Note from The Saucy Travel Mama: My family was hosted by Fairmont Chateau Lake Louise and Lake Louise Ski Resort. All opinions are mine, as always. This story includes affiliate links. Your clicks and purchases help to keep TravelMamas.com a free resource for readers like you. OMG, that place looks amazing. They thought of everything for families. I mean, they even have story time. I only regret I never took advantage of story time. We were too busy always being outdoors. Finding a place so child-friendly is a dream come true. I bet my kiddos would love a good ski week. Yes, it’s hard to find that right balance for families. You find it here, though! This is a great place for the whole family to enjoy. I love that aside from skiing there are other activities for the kids as well. Wow, this Lake Louise Ski Resort is an amazing place. I would love to explore it. That ice palace looks so cool. This looks like a great place to vacation with the family. What a beautiful way to experience skiing with kids, loving the view and all that there is there. It makes snow looks magical! It’s awesome that you can have a fun family vacation out there. I wouldn’t mind having a little ski getaway! I’d have to do some skating too. Lots to do besides skiing! This looks like so much fun. My kids have never been around that much snow. They would be so overwhelmed. There is a ton of snow here! More than in Banff. I have always wanted to take my family on a ski vacation. Lake Louise sounds like the perfect destination for families who love to ski! And plenty of options for non skiers too! Lovely place. Oh my goodness. the views are spectacular. I’d love to visit Lake Louise someday. The Ice Palace is jaw-dropping! Winter is a great time. Less crowds than in summer. I would love to bring my kids here! They will surely enjoy skiing! Come! We’d love to have you! I did not know that Lake Louise is famous for hosting the start of the World Cup every November. There also appears to be many great amenities here for the family. It hosts both the women’s AND men’s. Garmisch in Germany is the only other place that hosts both. Wow wow wow! Paradise! On my bucket list. 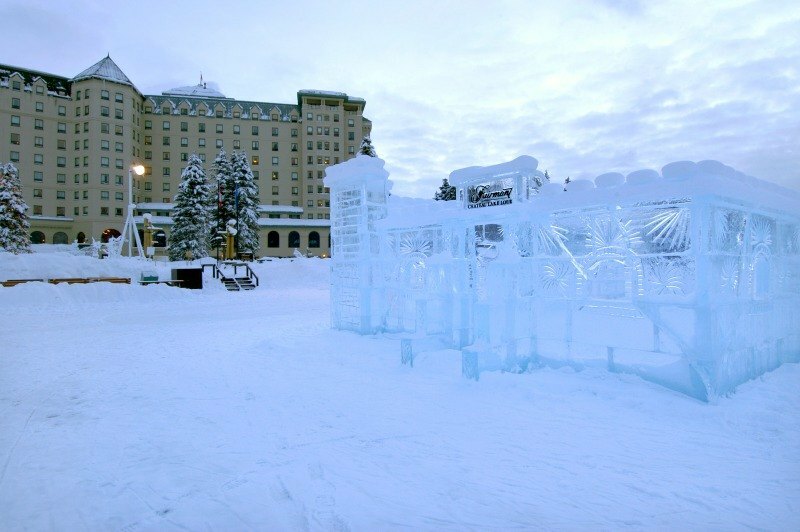 Look at the ice palace and that view of the hotel into the slopes. Great family destination. Yep. You summed it up perfectly. What an amazing place! A great place to visit for sure. Oh man, that place looks great! My kid would love the sledding part. I bet you would, too! My kids and I have always wanted to go skiing. This place looks perfect! the place looks very interesting! i love how it looks., its been always my dream to go skiing since we dont have snow in our country! No snow? Where are you living? I have always wanted to go to Banff National Park. Skiing at Lake Louise would be an amazing dram vacation. And cheap too if you’re converting from US dollars! I’ve never been skii-ing in my life. I guess I am just not a cold girl but maybe one day…this looks really interesting. Oh my god…A resort in middle of an ice mountain..i am looking at the heaven now..great place for a family vacation..Pictures are stunning….i am missing my childhood days now. Thanks for sharing this precious post.